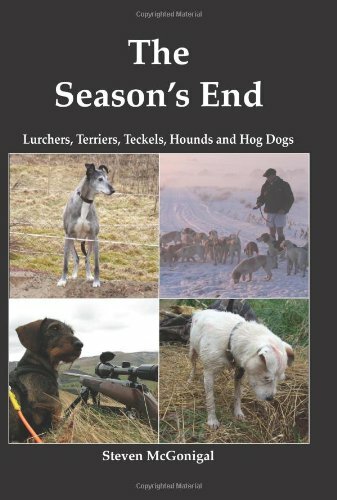 THE SEASON'S END: LURCHERS, TERRIERS, TECKELS, HOUNDS & HOG DOGS. By Steven McGonigal. Published by Skycat Publications. Sudbury, Suffolk. Publisher: Skycat Publications. Sudbury, Suffolk. Working dog enthusiasts from the UK, Ireland and even the USA, have all contributed to this publication authored by Steven McGonigal. With articles from Lurcher, terrier, teckel, beagle and even US Hog Dog enthusiasts, there's a little something for everyone. PAUL MORGAN IS A LEADING DEALER in scarce, out-of-print & new books on fishing and field sports. Paul has developed this business over more than thirty years. His business, Coch-y-Bonddu Books Ltd., carries the world's largest range of books on fishing and field sports, sporting guns and dogs, deer, big game hunting & falconry. Coch-y-Bonddu Books is also a noted publisher of fine sporting works, as well as being the custodian of the famous Flyfisher's Classic Library imprint. Under Paul's editorial direction, the list of titles available under both his Coch-y- Bonddu Books imprint and the Flyfisher's Classic Library imprint grows by the month. Coch-y-Bonddu Books Ltd., incorporated in the United Kingdom, Company No. 04636991. Registered address: 15 Heol Penrallt, Machynlleth, Powys, SY20 8AG. Business and correspondence Address: 13 Heol Pentrerhedyn, Machynlleth, Powys, SY20 8DG. YOU CAN PAY DIRECT THROUGH ABE BOOKS using the major credit cards. Postal Orders & UK Book Tokens. WE ACCEPT Mastercard, Visa & Switch, by phone on 01654-702837. ORDERS ARE USUALLY DESPATCHED within 2 business days, depending on the time of year. WE NEVER CHARGE MORE THAN £5.00 to most UK mainland addresses: - We will send an UNLIMITED number of books for £5.00, provided you order them all at one go. We will combine separate orders, but you must contact us immediately to arrange this. If we have already dispatched one of your orders by the time you contact us, unfortunately, we cannot do anything about it. OVERSEAS POSTAGE is charged by weight, at cost and is sent by Royal Mail's Priority Airmail service. The quoted cost is based on a single book of 2.2lbs or 1kg. If your book order is heavy or oversized, we may contact you to let you know that extra shipping is required.